Party time has arrived. Don't have a bunch of your friends awkwardly staring at you. Be ready with a range of teen group games. From simple games that require nothing to those that are more in-depth, get covered for any situation. Bring on the games and have some fun. For these games, you don't need anything but your friends and possibly music. They are best played with 10 or so people but might work with fewer. There isn't any setup, but you might need a large space. Playing Wink Assassin is fun and easy. Before starting, you'll need to choose a moderator. This person will choose the assassin and ensure that everyone is playing fair. The moderator will then secretly choose the assassin. You'll start by moving around the room mingling with each other and, most importantly, making eye contact. The assassin will then wink at someone. After about five seconds, to make the game a bit harder, the person to be winked at will die dramatically and leave the game. The more dramatic the better. You can then guess who the assassin is by saying, "I accuse..." If the person is right, they will become the new moderator and another game will begin. If not, then you'll do another round. The game continues until the assassin is found. This game can be more fun with music, but none is required. Have everyone stand in a circle. 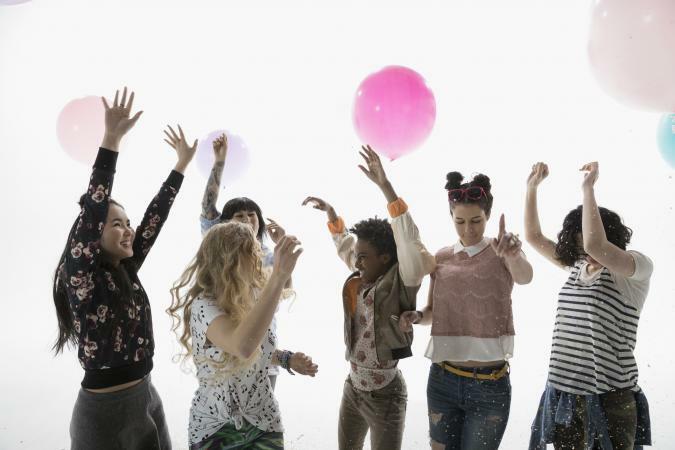 The person to throw the party will start by doing one dance move (twirl, tap, shimmy, etc.). The person to their right will follow the dance move and add one of their own. This continues through the circle until someone misses a move or makes a mistake. That person is then out. You continue until there is only one person left. It isn't out of the ordinary to lose multiple players in your first round. Truth or Dare is an oldie but a goody. Not only can secrets be revealed but dares can be a good time. Someone will need to start. This person can be chosen or volunteer. You'll then have a person pick truth or dare. With a truth, you'll ask them a truth question they must answer. Dares can be anything from eating something weird to running outside barefoot. If standard truth or dare gets boring, you can add a unique spin to your truth or dare session. Snap crackle pop is a mimicking game that requires to you imitate sounds. Teens stand in a circle. The first player (chosen or volunteer) makes some kind of noise with their hands or mouth. The next person makes the same noise (e.g. claps) then adds to it. The game continues until someone forgets the order. That person will then go into the middle of the circle and try to distract the other players. The game continues until only one person is left. To really make it fun, try to go as fast as you can. This game is similar to the old school telephone game but with body movements. You and your friends stand in a long line. Everyone faces forward with their eyes closed. The first person in the line will turn to the next person who opens their eyes and acts out an action for five seconds. The next person in line will turn and try to mimic the first person. This will continue until the last person. The last person must guess what the action was. If they guess right, they go to the front. If they guess wrong, you do a scramble and mix up the line before starting again. Charades material or actions can have a theme like animals or be picked randomly. The party thrower will start this game with a question to another player of their choice. You can either make the questions up or find different questions online. The player must answer which one they would choose. After answering, that player will ask a question of another player. The round isn't over until everyone has been asked a question. You will then start again. Are you looking for a game that is more unique than truth or dare? This list of games takes a bit more time and thought. They also require specific materials. You've played the old-fashioned game of telephone where one person whispers a phrase to the next down a line. But, have you ever tried it with modern technology? Groups of any size can spread a message quickly, but can they get it right? This twist on a classic game is a great way to bring gatherings, like youth groups, into the modern age without compromising wholesome fun. The more players you've got, the higher the chances of messing up the original message. Seat players in a line. The group leader writes a two or three sentence message on a piece of paper and hands it to the first person in line. This person has fifteen seconds to memorize the message before the leader takes it away. This first player writes a text message, trying to make an exact copy of the message they just read. The first player then shows the second player, the message on their phone for 15 seconds then takes it away. The second player now writes a text message, trying to make an exact copy of the message they just read and shows it to the next person in line. Repeat steps three and four until the last person looks at the text message. This person reads the message out loud. Then the group compares their texts with the original message. Make the game easier or more difficult by changing the size of the original message or the time limit for reading the message. Can you get your teammates to guess an object based on a series of close-up pictures? That's what Guess That Picture is all about. This game is great for large groups because you can split into smaller teams who will compete to identify the same object using different pictures. Separate the group into smaller teams of at least three players each. Create a score sheet with each team name across the top in different columns. Designate one person from each team as the photographer. This person will secretly take four close-up photos of an object chosen by the group leader. If you don't have a group leader, put the names of objects around the room in a bowl and pick one out for each round. While the photographer is taking pictures, all other team members must close their eyes and cover their ears. Once all photographers return to their team, the leader taps players to let them know they can open their eyes and uncover their ears then yells "Start." Each photographer can show only the first picture to their team in the first ten seconds. Teams have two minutes to identify the object. They can choose, as a group, to see the second, third, and fourth pictures at any time after the initial ten seconds. However, teams who guess correctly using one picture get five points, those using two pictures get four points, if they used three pictures they get three points if they used all four pictures they get two points. Repeat steps 2-6 with a different photographer each time until all team members have a chance to be the photographer. Classic scavenger hunts with a twist can be a lot of fun. Divide teens into groups of five or six and give each team a sock puppet as their mascot. Challenge groups to complete a scavenger hunt by seeking out specific objects or locations and snapping a picture of their mascot with the team by each item. Allow time for each team to customize their sock mascot with craft decorations if desired. Give each team a list of items or locations. For example, an outdoor hunt during school hours might include playground slide, tennis net, hurdle, bleachers, home plate, handicap parking sign, classroom number on a window, yellow flower and a ball. Aim for about ten to twenty items depending on how long players have to complete the task. Each team must take a picture of their entire team and the sock puppet with each item on the list. Once teams find all the scavenger hunt items, they return to the group leader who checks all their images. The first team back to the leader with all correct images wins. Use a pair of standard six-sided dice and some creativity to get your friends from one end of the room or field to the other. Directive Dice is a fun indoor or outdoor game for groups of any size. Get creative with your directions and the game gets even more fun. Start by splitting the group into two or more teams of up to seven players on each team. Designate one player from each team as the Roller who will roll the dice for the entire game. Line all players except the Rollers at one end of the room. Assign numbers to each player on the line so each team has players numbered one through six. If you don't have enough lined up players to assign all numbers from one to six, give some players two numbers. Each Roller, at the same time, rolls both dice. The die on the Roller's left indicates which player from their team gets to move. The die on the right indicates how that person can move for a count of three seconds. As soon as the dice are still after a roll, the Roller yells out "Player Number (whatever the left die says)" followed by the movement directions then immediately starts counting to three using the one, one thousand methods. For example, if a Roller gets a one and a four, the number one player on their team would crab walk backward. The moving player has three seconds to move toward the finish line using the directed movement only. When the three seconds are up, the moving player stops, and the Roller rolls the dice again. Gameplay continues until all members of one team make it to the finish line on the other side of the room. The team who gets all their players to the finish line first wins. In Tumbling Towers teens race to build the tallest tower out of random household objects. You'll need small groups of three or four for each team but can have as many teams as your space allows. Place all the building materials in the center of the room. Give each team a coin. On "Go" each team flips their coin for directions. Heads means they must place one item horizontally and tails means they place an item vertically. Players on each team take turns flipping the coin and following the matching directive. If two players in a row flip tails, the team must remove the top item from their tower. The team with the tallest tower when the materials run out wins. In case of a tie, replace all building materials in the center of the room and repeat gameplay for the tying teams. This hilarious game uses a bunch of household items, essentially everything but the kitchen sink, to re-imagine a game of badminton. Since you'll be creating teams similar to the game of Badminton, larger groups work best. Create a line down the center of your playing area and place an equal number of players on each side of this "net." One player starts by serving the paper wad across the net with a hit from their "racket." If the wad doesn't cross the net, the other team gets to serve. If the wad crosses the net, the other team tries to hit it back to the serving team. Each team gets one point for every time their team gets the wad across the net, regardless of whether it gets returned or not. This includes serves. The team with the most points when the time is up, wins. 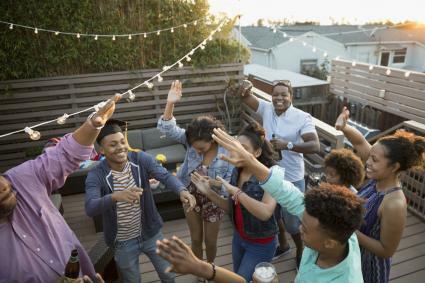 Group party games help pass the time and create bonds among teens in any kind of group setting from classrooms to siblings home on a snow day. Take inspiration from common recreational games and create your own fun using whatever materials and space you've got.